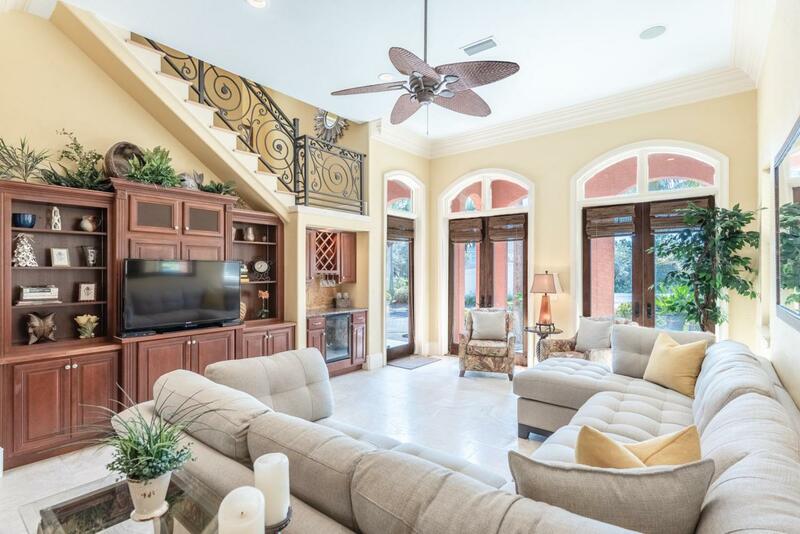 Only a short distance separate this Mediterranean style home at Palmeira Villas in Blue Mountain Beach from beach access; the most difficult decision you will have while enjoying this Gulf view home will be whether to relax at the beach or beside your very own private pool. French doors crowned by elegant, arched transom windows invite you into the open living areas, conveniently situated on the ground floor. Large, 18-inch travertine tiles adorn the floors, joining the living room area with built-in media cabinet and dry bar with mini-fridge, with the kitchen and dining room areas. The kitchen features a center island with bar seating for four, a stainless steel Kenmore Elite appliance suite, granite counters and travertine subway tile backsplash.Dinner guests will be impressed by the coffered ceiling detail in the dining room, whose French doors lead onto the pool deck in the back yard. Built-in speakers maximize enjoyment of this outdoor space that includes a lawn area and shower for care free clean-up after a day at the beach. A full bath, whose walls are clad entirely in travertine tile, join a spacious laundry room to complete the first floor. At the top of the stairs on the second floor is a bonus living area with the potential to expand its already sizable sleeping capacity. The first of three guest bedrooms on the second floor features its own private bath, walk-in closet and French door access to a private, covered balcony which faces the front of the home. Two additional guest bedrooms, one of which features a private balcony that overlooks the back yard, share an additional full bath. The sun-filled staircase from the second floor to the secluded, third floor master bedroom is lined by strikingly tall windows that create a true sense of grandeur. This retreat enjoys its own covered balcony with Gulf view, room for a cozy sitting arrangement, built-in speakers, a walk-in closet, and private bath with walk-in shower, jetted tub and double vanity. County Highway 83 can be taken approximately two miles north to Highway 98, placing shopping, dining and entertainment in Destin to the west, or Panama City Beach to the east, within convenient reach.